While known primarily as an exhibitor of artist-made films, San Francisco Cinematheque has, throughout its history, created opportunities for talking and writing about the challenging and lively work that it showcases. Cinematheque's “occasional” journal Cinematograph is back, after a long hiatus, with an illuminating book-length issue, comprised of extensive conversations with filmmakers, artists, curators, and scholars. 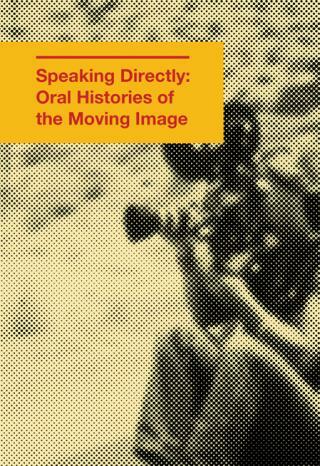 Titled Cinematograph 7: Speaking Directly—Oral Histories of the Moving Image, it presents recent discussions with Coleen Fitzgibbon, Narcisa Hirsch, Jim Jennings, Chris Kennedy, Kerry Laitala, Annette Michelson, Tomonari Nishikawa, Elizabeth Price, Ben Rivers and Kidlat Tahimik. Interviewers include Erika Balsom, Kathy Geritz, Sandra Gibson, Aily Nash, Luis Recoder, Lucy Reynolds, Jonathan Walley and Mark Webber. The issue also has never-before-published excerpts from Q&A sessions with Peter Hutton, George Kuchar, Owen Land and Warren Sonbert, drawn from Cinematheque's archive of historical artifacts and documentation.